If you’re searching for a plumbing, air conditioning, or heating company in Prospect Park, NJ, contact Rite Rate Heating & Cooling! You can call us for anything including air conditioner installation, burst pipe replacement, or heating repair. Our plumbing, heating, and air conditioning company has been providing first-class services for many years and we pride ourselves on 100% customer satisfaction guaranteed. Rite Rate offers free estimates so call us anytime for a quote and we’ll be happy to help! Is your boiler or furnace leaking? Is there no hot water in your kitchen or bathroom? 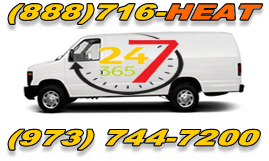 Our heating repair in Prospect Park, NJ is available to you 24-hours a day 365 days a year. Anytime day or night and we’ll quickly fix whatever is wrong with your heating system. We’ll be able to diagnose the problem and recommend either repair or replacement. If you need a new heater, we can also install any furnace, boiler, hot water heater including tank water heaters and tankless water heaters. At Rite Rate, we offer to schedule routine maintenance to ensure your heating system is working efficiently. Contact our heating company in Prospect Park, NJ for the best heating services in the area! When your AC breaks overnight or your current one is outdated, Rite Rate is your go-to reliable air conditioning company in Prospect Park, NJ. Our technicians work around the clock 24/7 to offer you emergency air conditioner repair when you need it immediately. We’ll have your air conditioner working again in no time. If the AC compressor, fan, condenser, or the entire unit needs to be replaced, we’ll take care of replacing it quickly. Are you moving into a new home or commercial building and it doesn’t have an air conditioner? Rite Rate can offer affordable air conditioning installation and we’ll even recommend the best one for your location. Should your residential or commercial AC need a routine checkup, we provide air conditioner maintenance services as well. Whenever you need an experienced air conditioning company, contact Rite Rate Heating & Cooling! Is your bathroom toilet clogged and overflowing? Did a pipe burst and is now flooding your house or business? Rite Rate is an excellent plumber who will take care of all of your plumbing emergencies quickly and efficiently. Our company offers 24/7 plumbing repairs in case anything goes wrong with your commercial or plumbing system overnight, on a weekend, or holiday. You’ll never have to worry about waiting until morning to call a plumber! When it comes to toilets, showers, faucets, sinks, sump pumps, bathtubs, and other plumbing fixtures, we can handle installing, repairing, and replacing them. There’s nothing we can’t handle as we offer frozen pipe repair, drain and sewer cleaning, water damage restoration, and much more. Give Rite Rate a call today for quality plumbing services!